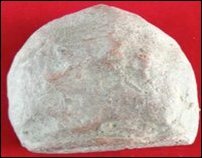 More and more evidences surfacing at Jaffna fort indisputably prove that the colonial fort was built on an earlier archaeological site going back to the early centuries of the Common Era. 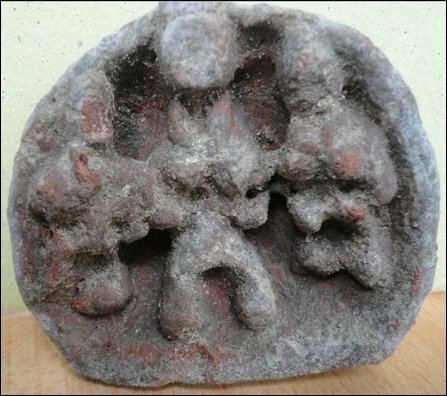 The latest findings are a terracotta tablet of folk religious affinities and brick structural remains found 4.5 feet below the rampart walls at the western side of the fort. Earlier, Rouletted Ware pottery and a Lakhsmi coin datable to the early centuries of the Common Era, pottery of c. 5th century CE, and Arab-Chola-Chinese pottery of 7 - 13 centuries CE were found at three locations in the fort site, since Netherlands funding Colombo has embarked on renovating the Dutch fort in the last couple of years. The brick layers and the terracotta tablet found beneath the rampart walls indicate that there were earlier structures at the site where first the Portuguese and then the Dutch built a fort, says Professor P. Pushparatnam of the Jaffna University’s History Department. 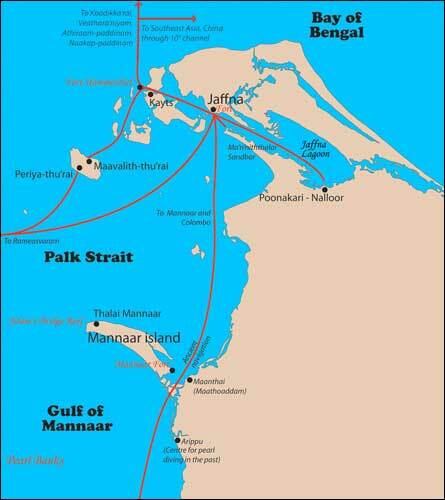 As the Netherlands government is keen in completing the renovation of the Dutch fort before the end of this year, the present archaeological investigation that takes place at the site is only a kind of rescue excavation hurriedly done, academic observers in Jaffna said. Earth excavator machines were used to scoop the earth at the western ramparts of the fort, facing the Pa'n'nai Sea of the Jaffna Lagoon. The bricklayers found beneath the foundation of the rampart wall were destroyed in the process, but the terracotta tablet was retrieved from the scooped earth by an alert archaeological supervisor present at the site. Realising the value of the clay tablet the supervisor has cleaned it and has handed it over to Colombo’s Archaeology Department. Fortunately it was photographed, as objects reaching Colombo’s Archaeological Department also go “missing” sometimes. 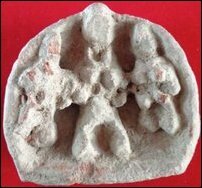 The terracotta tablet made of mould, shows a garlanded female deity of folk religious attributes at the centre, with a man and woman probably devotees or attendants kneeling on either side. The round, flat and formless face of the deity reminds characteristics of folk religion and art in South Asia. The tablet measures 6.3 cm vertically and 6.6 cm horizontally. The bottom is flat while the figures are found inside an arched shell. The groove at the bottom shows it was fixed on something. It was probably an image for household worship. So far rescue excavations were conducted at three spots at the fort site. In a pit excavated near the entrance of the fort by the Jaffna University, human remains and Chinese ceramics datable to 10 - 13th centuries CE were found. Excavation was not continued at this spot. Inside the fort, Rouletted Ware of the beginnings of the Common Era and Arab-Chola-Chinese pottery of 7 - 13 centuries, have been found. Excavations in front of the armoury of the fort have brought out pottery of c. 5th century CE, says Prof Pushparatnam, citing Colombo’s Archaeology Asst. Commissioner Dr. Nimal Perera.